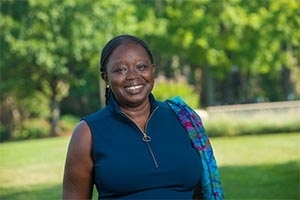 Today, American University President Sylvia M. Burwell announced that Dr. Fanta Aw has been appointed Vice President of Campus Life and Inclusive Excellence, an expansion of her current portfolio of leadership responsibilities as VP of Campus Life. As the university implements the American University Plan for Inclusive Excellence, Dr. Aw will lead, coordinate, monitor, and assess all work related to the Plan, and ensure that the Plan's goals are met. President Burwell launched the Inclusive Excellence Plan, a far-reaching effort to build a truly inclusive community at the University, earlier this year on January 30. "I am committed to achieving the goals we set forth in our Inclusive Excellence Plan," said President Burwell. "As one of the primary architects of our inclusive excellence strategy, and a sociologist and higher education professional experienced in diversity, equity and inclusion, Dr. Aw is supremely qualified to lead us in implementing this important work. Dr. Aw will report directly to President Burwell and will focus on strengthening existing partnerships across campus and continue to work closely with the President's Council on Diversity and Inclusion. As a three-time alumna of AU, Dr. Aw has expressed that "this work is important to her both personally and professionally." "The work of inclusive excellence requires ongoing and systemic investment on the part of all to achieve measurable results," said Dr. Aw. "This is an exciting time for AU and I am honored to be part of this important effort to make our institution more equitable and inclusive." Training, learning, and development to equip members of our community to lead change in a complex world. A focus on campus climate, culture, and community, so that all community members feel that they belong here. Changes to our systems, policies, and procedures to promote diversity, inclusion, transparency, and accountability. Access and equity in the way we recruit, hire, train, develop, evaluate, and recognize faculty, staff, and administrators. A focus on curriculum and instruction to ensure that our core curriculum demonstrates critical inquiry, intellectual engagement, and respectful discourse. Having spent 25 years in higher education administration, Dr. Aw brings a wealth of experience to her new expanded role. She earned three degrees from American University: BS in Accounting, MA in Public Administration (with a concentration in organization development), and Ph.D. in Sociology. Her research focuses on the political economy of international education; transnational migration and diaspora communities; and race relations.